Struve_Rating is an independent public project of the Perm forum for annual assessment of indicative events, projects and people. The rating focuses on everything that has left a considerable marks during the past year — what has changed us, our society and our country. In the “Nation” category we select the events and occurrences that have rendered maximum effect on the state of affairs nationally. In the “Society” category we select the most important public initiatives having the greatest effect and characterizing the past year. In the “Person” category we select a person of the year, whose actions and achievements have most greatly affected us and our country. The Struve_Rating 2012 covers the period of April 25, 2011 (end of the VII Perm Forum) to April 07, 2012. Presentation of nominees and voting on the page of the Perm Forum on Facebook. Summarizing and compiling shortlist of 3 nominees in each category. General voting of internet users on Facebook page and forum participants on site, summarizing, determining the winners in “Person”, “Society” and “Nation” categories. Academician Peter Berngardovich Struve was born on January 26 (February 7), 1870 in Perm, in the family of the governor. He spent his early years in Perm and Stuttgart (Germany), and in 1882 his family has moved to Petersburg. Peter Struve studied on the science and then on the legal faculty of the Saint-Petersburg University, received further education in Graz (Austria) from the famous sociologist, Ludwig Gumplowicz. The first Struve’s book “Critical Notes on Economic Development of Russia” (1894), further developing some ideas of K. Marx on example of Russian materials, has started the struggle against the principles of “populism” and “unique path” of the social development of Russia. By 1900–1901, Struve opposes the social democrats concerning the “power” and “law” in historical development: “Reactive violence of autocracy is aimed to be defeated by social democrats through revolutionary power of people... It only wants another holder of power... The law in its outlook is not the idea of what is due but an order of the...”. Developing the idea of law, Struve takes the position of classic liberalism. Participation of P. B. Struve in public events results in his exile to Tver and in immigration to Germany, where he publishes the non-censored political magazine “Liberation”, which is illegally transported to Russia. In 1905 Struve returns to his homeland and takes part in formation of Constitutional Democracy Party (“People’s freedom party”), in the lists of the Constitutional Democrats he is elected a deputy in the Second State Duma (1907). During the inter-revolutionary period, P. B. Struve’s journalistic talent and energy as an editor of authoritative public and political publications reveals completely. From 1906 to 1918 he works as editor in “Russian Idea” magazine; having acted in 1902 as an initiator of the well-known collection “Problems of Idealism”, he becomes the active participating author of “Milestones” (1909) and “From Depth” (1918) collections. In 1913, P. Struve defends his master’s thesis, and in 1917 — his PhD thesis. He is the Professor of Economics in the Saint-Petersburg Polytechnic Institute; in spring 1917 he is elected an acting member of the Science Academy in the political economics department. After bolshevist revolution, P. B. Struve participates in formation of the Volunteer Army, becomes a member of the Don Civil Council, member of the Special Conference of General A. I. Denikin, minister of foreign affairs in Crimea government of General P. N. Vrangel. He then lives in emigration — in London, Sofia, Prague, Paris, where he edits the restarted “Russian Idea” magazine and authoritative emigration papers: “Revival” (1925–1927), “Russia” (1927–1928), “Russia and the Slavic” (1928–1934). In 1926, Struve chairs the Russian Foreign Congress aimed at uniting the emigrants. From 1928 to 1940 P. B. Struve is the professor of the Russian Science Institute in Belgrade. During the German occupation, he was arrested by Gestapo, spent three months in Nazis prison. In 1942 he returned to Paris, where he died on February 26, 1944 at the age of 74. His ashes rest on the Сент- Sainte-Genevieve-des-Bois cemetery near Paris. The core of the liberal outlook of Peter Struve is the concept of “individual suitability” worked out by him in 1907–1910, and then further developed in emigration. It became the result of deep self-criticism and re-evaluation of personal role in the first Russian revolution and traditional methods of struggle against the existing regime. Struve has put forward the thesis that the destiny of major social evens is in the end defined by the type of human behavior. One of the main drives in the Struve’s research was the topic of fateful mutation of the Russian cultural class in “degenerated intelligentsia”, rushing about two anti-civil states: social apathy and conformism, on the one hand, and “false activism” — on the other hand. To avoid these two extremes, a well-thought system of human education is required: education of the citizen and nation by the culture. P. Struve believed that no political advancement is possible outside the cultural progress; otherwise, any political achievements will turn out to be a phantom. “Individual suitability” opposing all forms of individual irresponsibility and social leveling is the intellectual, creative, morally motivated work of an individual aimed at creation of the civil society — self-conscious and self-regulating political nation. Aleksey Kara-Mura, the President of the Russian Liberal Heritage National Foundation is a prominent researcher of the creative and philosophical heritage of Peter Struve. His book titled Freedom and Religion. Christian Liberalism in Russian Political Culture, written in partnership with Olga Zhukova, has come out in the RAS Institute of Philosophy Publishers this year. His book raises an important for the Russian social and cultural philosophy thought issue of the synthesis of liberal and Christian values in the Russian cultural and political tradition. 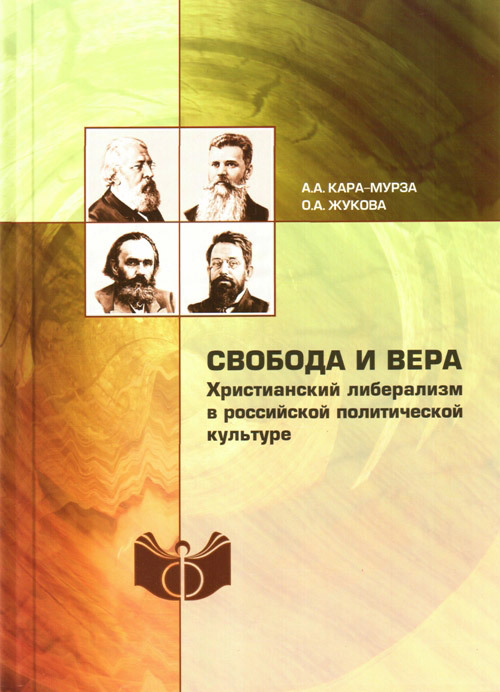 The authors pursued the goal of reconstructing the Christian-liberal (liberal & conservative) tradition in the intellectual and political experience of such prominent public figures of the XIX–XXth centuries Russia, as Ivan Aksakov, Mikhail Stakhovich, Vasily Karaulov, Peter Struve, who saw the evolutionary road of development for Russia as the synthesis of the Russian “uniqueness” and of the European “universalism” in the logic of acquiring personal freedom as the foundation for law and order. For further information on the book, visit rusliberal.ru.